Florida Gulf Coast University Provost Jim Llorens, center, and Mote Marine Laboratory President &amp; CEO Michael Crosby, right, add their signatures to a Memorandum of Understanding that kicks off a partnership addressing impacts of harmful algal blooms to Florida’s environment, economy and quality of life. 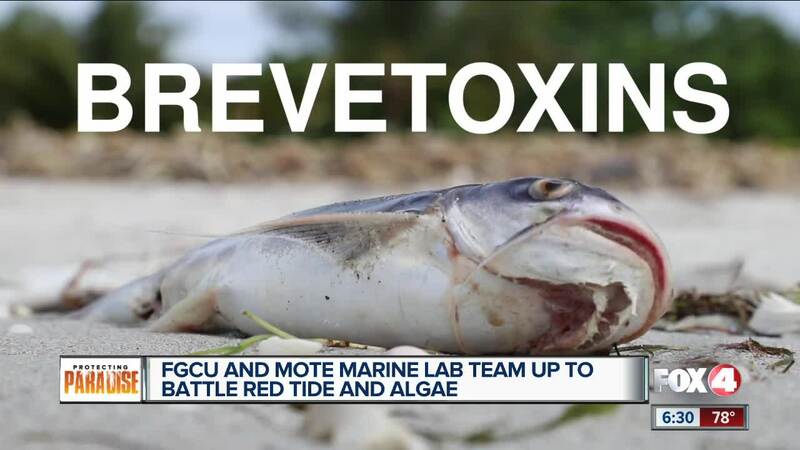 FORT MYERS, Fla. -- Florida Gulf Coast University and Mote Marine Laboratory & Aquarium are working together to address the impacts of harmful algal blooms to Florida’s environment and economy. A Memorandum of Understanding was signed Thursday by Mote President & CEO Michael P. Crosby and FGCU President Michael V. Martin, setting the framework for future collaboration between the two organizations. Mote and The Water School at FGCU will be pursuing productive scientific research, innovative technology development, and undergraduate and graduate education with a focus on harmful algal blooms. FGCU graduate students are already hard at work researching different toxins found in marine life and our water. “The real big goal is food safety, health safety and continual monitoring to know if this toxin is present even if there’s not a big bloom of it,” said Adam Catasus, FGCU graduate student. Several opportunities for partnership between the two organizations are outlined in the MOU, with a term of five years and the option to renew. · Joint appointments of instructional and research faculty for undergraduate and graduate courses, procurement of funding for research, and implementation of cooperative research projects.